Profigold and Profigold Oxypure cables provide outstanding value for money coupled with superb performance. Profigold PGD and Profigold Oxypure PGD cables are available in a choice of digital coaxial and digital optical cables, providing clean natural sounding hi fidelity audio. The Profigold Oxpure digital coax and digital optical leads provide the ultimate in home cinema using next generation materials. 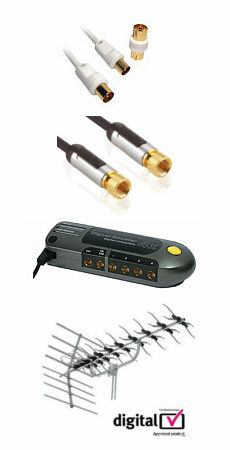 Perfect for DVD digital audio connections in home cinema systems. Profigold PGA and Profigold Oxypure PGA cables are available for stereo audio connections and mono subwoofer connections. Providing clean natural sounding hi fidelity audio the Profigold is the cable of choice for stunning home cinema and hi-fi. The Profigold Oxpure audio leads provide the ultimate in home cinema and hi-fi using next generation materials. Profigold PGV and Profigold Oxypure PGV cables are available for a wide range of video connections including, scart to scart, scart to component, scart to RGB4, component video to component video, s-video to s-video, s-video to scart, scart to s-video and composite video phono to phono. Enjoy crisp pictures with vibrant colours, perfect for connections between DVD players, digiboxes, freeview stbs, sky+ etc and TVs, plasma screens, LCD TVs and projectors etc. The Profigold Oxpure video leads provide the ultimate in home cinema picture quality using next generation materials. IAT EMI supressors provide excellent RFI/EMI performance.